A new and cheap ($20) angle grinder, 10500 RPM, 220 VAC, 500 W. I suppose it employs a so-called "universal motor". 15 cm diameter, 8 mm tick, can be easily balanced with a file by mounting it with a shaft on the drill. made of 4 mm diameter tungsten sticks, 15 mm long. You can use the angle grinder with a diamond blade to cut the tungsten. Drill to 3.9 mm holes in the bachelite disk and press-fit the 2 electrodes with a hammer. made of 4 mm diameter tungsten sticks, 30 mm long: they are mounted in two brass blocks (6 x 1.5 x 1.5 cm). The electrodes can slide in and out a 4 mm hole and can be fixed in position by a screw. 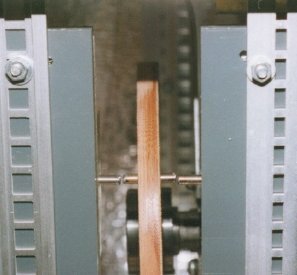 The brass blocks are mounted on two teflon supports to provide isolation without fusing up to about 300 C. The clearance between fixed and rotating electrodes is 2 x 1 mm. 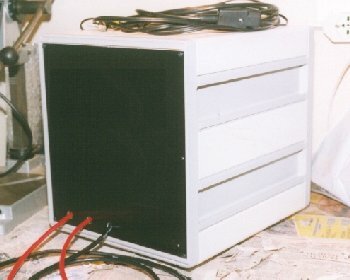 A surplus case, sized about 30 x 25 x 30 cm, with 3 mm thick walls of aluminum and steel, contains the whole RSG and protects me from flying tungsten "bullets". It is isolated with noise absorption foil (from the inside) to avoid annoying neighbors phone calls to the police. A triac, home-made speed control with no feedback. This means that I have no torque control and speed changes require some seconds to stabilize to a constant speed, but the simplicity of the schematics (20 minutes to built it) makes it a winner. The RSG accounts for a top break rate of 10500RPM : 60 s x 2 = 350 breaks/s. I connect my RSG in PARALLEL to my RQ gap, after having increased the number of sections in use from 3 to 5. This way, the RQ gap works as a kind of safety gap for the bangs missed by the RSG (if any). 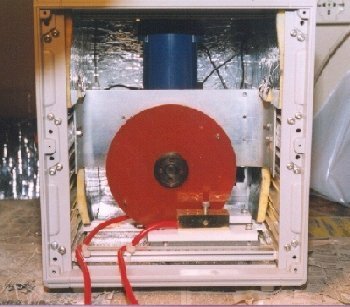 After running the RSG for about one hour with my Tesla Coil, cycles of 30 s on and 30 s off, there is almost no sign of melting or wear on the electrodes. Opening the case quickly after operation reveals also that the brass blocks get only slightly warm.